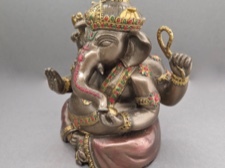 This small but powerful Ganesha figurine represents the most beloved diety in Hinduism. He is highly regarded for his benevolence, his kindness and his willingness to hear the pleas of his followers. He is seated with his right hand raised in a sign of blessing. 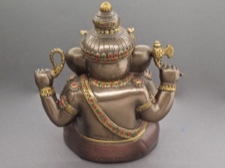 This figurine is 4.5 inches tall, its base is 3.25 x 2.5 inches. 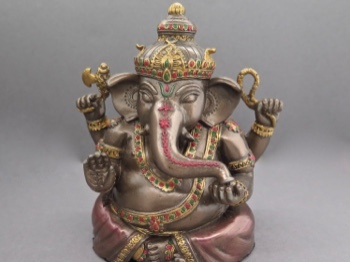 He is made of cold cast bronze which has a resin core with bronze plating, then handpainted. May you enjoy this well loved deity!